Take it easy at this cute, dog-friendly creekside cabin with a private hot tub and jetted tub! The nearby area is private and wooded, and it's just a few miles to Unicoi State Park for fishing swimming, and picnicking. The Bavarian-themed town of Helen is just four miles off if you're in the mood for excellent German food and unique shopping. 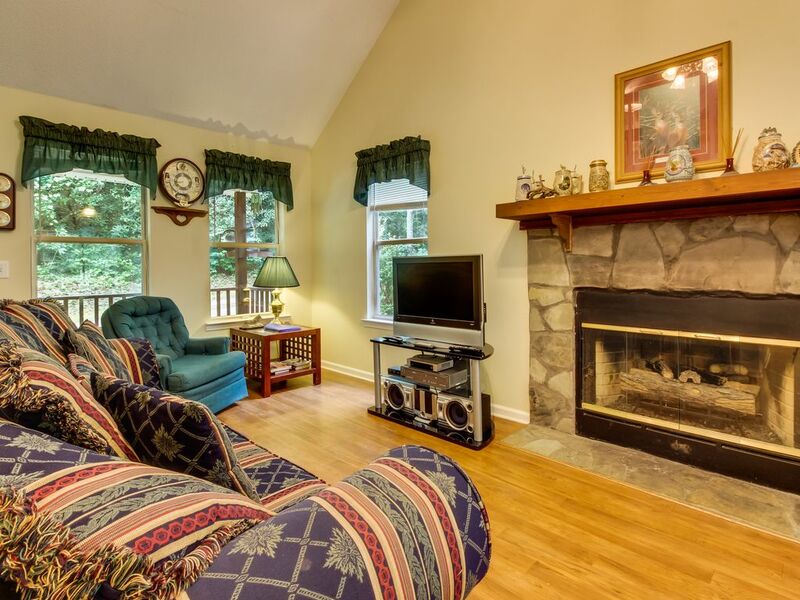 Cozy up in the living room with comfy seating, with a seasonal gas fireplace while you watch a DVD. WiFi helps you stay on top of communications, and just out the back door is your private hot tub. When you're feeling peckish, a full kitchen with coffeemaker and dishwasher is up to your cooking desires. A sliding glass door leads to the back deck, which has a grill and a table and chairs. Down the steps is the yard, where your dog (up to three are allowed) can romp around (please note that there is a small nightly pet fee). There's even a creekside bistro table! On the first floor, the bedroom has a queen bed and an en suite bathroom with a Jacuzzi. The upstairs loft has a second queen, offering plenty of space to four lucky guests. Explore the local trails on foot or by bicycle, and marvel at the spectacular views. Catch some fish for supper in the Chattahoochee River, or take a romantic ride in a horse-drawn carriage in the charming town of Helen. It's time for a break - book this lovely cabin today! Parking Notes: Motorcycles are allowed, but please leave your trailer at home. The driveway is gravel. The location of the cottage is great. Its about a 5 minute drive into Helen yet secluded in the woods. No others cabins nearby. The dogs enjoyed roaming the outdoor area. We really enjoyed the large hot tub. The cottage itself needs a good deep cleaning (dusty baseboards, furniture) and some updating. We only stayed for 2 days and found the over all accommodations to be good. It was a pleasure hosting you, Rob! Your feedback is valuable to us, and we will pass it onto our management team to check for repairs needed on the back porch. We would love the opportunity to host you again in the future!